Golden Pass Products, a partnership of Qatar Petroleum International and ExxonMobil affiliates, has submitted an application to the U.S. Department of Energy (DOE) to export liquefied natural gas (LNG) from the Golden Pass LNG receiving terminal at Sabine Pass, Texas. The proposed project involves construction of natural gas liquefaction and export capabilities at the existing Golden Pass LNG facility. A final investment decision will be made following government and regulatory approvals. If developed, the project would represent approximately $10 billion of investment on the Gulf Coast, generating billions of dollars of economic growth at local, state and national levels and millions of dollars in taxes to local, state and federal governments. The project would generate approximately 9,000 construction jobs over five years with peak construction employment reaching about 3,000 jobs. The proposed project would have the capacity to send out approximately 15.6 million tons of LNG per year. New infrastructure required to export will be located on the existing property, which currently contains two berths for LNG tankers, five storage tanks and access to the Golden Pass pipeline. The expanded facility would then have the capability and flexibility to both import and export natural gas. The proposed expansion of Golden Pass is an opportunity to capitalize on America’s abundant natural gas resources. The Energy Information Administration’s Annual Energy Outlook 2012 shows that the United States has substantial gas supplies that can support gas exports, including LNG exports, over the longer term. The application filed with the DOE is to export natural gas to nations that have existing free trade agreements (FTA) with the United States. A similar application is planned for non-FTA countries. Washington, 6 December (Argus) — US Department of Energy (DOE) will not grant additional licenses to export domestically-produced natural gas to all international markets until completing a review of cumulative economic impacts of liquefaction projects on US markets, a senior agency official said today. The federal energy regulators appear to be sensitive to political pressure that could arise if LNG exports from the US lift domestic natural gas prices. The agency could reconsider the already granted applications if energy security or other factors are an issue, according to John Anderson, manager of natural gas regulatory activities at DOE’s Office of Fossil Fuels. Developers have proposed six US liquefaction projects encompassing a total export capacity of 69mn t/yr, or the gas equivalent of 9.5 Bcf/d (269mn m³/d), based on agency records. 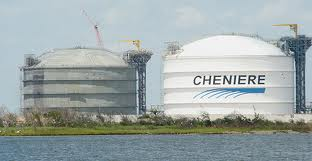 Cheniere Energy’s proposed 2.2 Bcf/d Sabine Pass liquefaction plant in Louisiana secured DOE permission to export to all international markets in May, following an eight-month review. But other proposed projects will have to wait until DOE reviews two studies it has commissioned to look into cumulative impacts of liquefaction projects and exports, Anderson said today in Washington, DC, during a briefing hosted by the US Energy Association. The studies are expected to be completed in the first quarter of 2012, he said. A study by the Energy Information Administration (EIA) will focus on the effect of LNG exports on domestic prices of natural gas. That EIA study will serve as the basis for analyzing cumulative economic effects of LNG exports that will be conducted by an external contractor. In addition to cumulative impacts, the agency is looking at adequacy of US natural gas supply, energy security, impact on GDP, balance of trade and other criteria in informing its decision in granting blanket licenses, Anderson said. A critical factor appears to have been omitted: a project’s commercial viability. Unlike the Federal Energy Regulatory Commission, DOE does not require developers to prove viability, focusing only on analysis of what happens if the terminal is built, Anderson said. Economic modeling accompanying project applications just assumes that exports are taking place, consultancy ICF International‘s vice president Harry Vidas said during the briefing. ICF prepared the economic analysis that accompanied Cove Point’s application with DOE. Since commercial viability is not a criterion, projects are effectively considered on the first come-first serve basis. Developers who filed first may secure export licenses and preclude subsequent projects from being realized because of perceived cumulative impact of exports on domestic prices, even if the initial projects are never built. That scenario is hypothetical, Anderson said, even though it has analogies in the past since only a fraction of proposed US LNG import terminals were built over the past decade. If economic circumstances change in the future, “we can modify any [export license] order although we respect contract sanctity,” he said. US laws allow DOE to direct natural gas producers to curtail sales or allocate them to what the federal regulators consider a higher-priority use, according to Anderson. “We would not want to use [that authority], but we can,” he said. ExxonMobil Corp is actively assessing options to export liquefied natural gas from North America, where it is a top producer of the fuel. “In terms of exports from North America, whether it is the Gulf Coast or whether it is Western Canada, it’s something we’re actively looking at,” Andrew Swiger, senior vice president of Exxon said at a Bank of America Merrill Lynch investors conference. North America market is different from places where Exxon has LNG projects because the gas is not stranded without a viable market, so the company is mulling options, Swiger said in remarks broadcast on the Internet. Exxon has 340,000 shale gas acres in Western Canada’s Horn River Basin. The company also has a stake in the Golden Pass LNG Terminal in Texas. 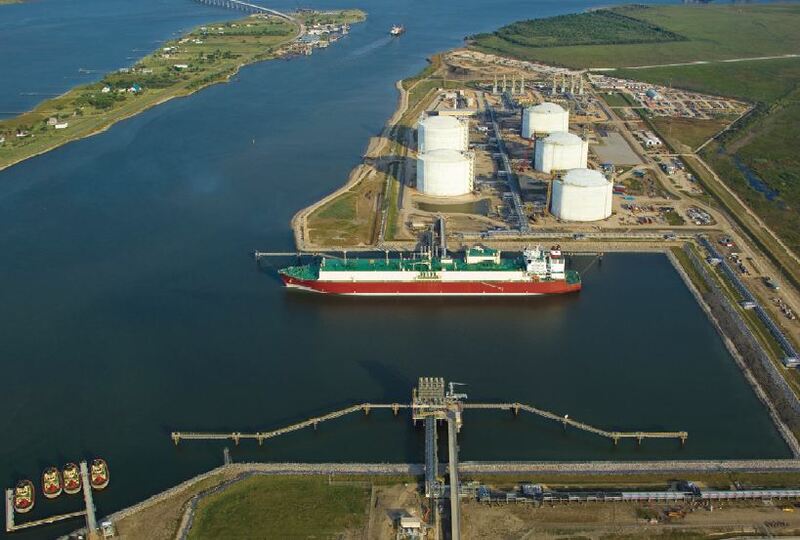 Located two miles northwest of Sabine Pass, Texas, and 10 miles south of Port Arthur, Texas, the Golden Pass LNG Terminal is situated on the Sabine-Neches Waterway that separates Texas and Louisiana. The LNG terminal will include two ship unloading berths, five full-containment storage tanks, vaporization facilities, and gas send-out and ship unloading systems. The $1 billion contract for engineering, procurement and construction of the project was awarded to Chicago Bridge & Iron Company NV (CB&I) in August 2006. Construction began on the terminal the following month, with operation start-up slated for mid-2009 and total construction completion planned for 2010. On September 28, 2010, Golden Pass announced that it expected to receive its first LNG cargo during October 2010. The commissioning cargo was en route from Ras Laffan, Qatar via a Q-Flex LNG carrier. LNG will be shipped to the Golden Pass LNG Terminal primarily from the Ras Laffan 3 and Qatargas 3 projects in Qatar. The terminal will then re-gasify the hydrocarbons. Processing capacity for the terminal is 15.6 million metric tons per year of LNG, which is comparable to 2 billion cubic feet of natural gas a day. Natural gas will be sent from the Golden Pass LNG Terminal by pipeline to US markets. In addition to the LNG terminal, the project scope includes the Golden Pass Pipeline, which is a 42-inch pipeline that will span 68 miles across four Texas counties and one Louisiana parish to connect with 11 interstate and intrastate pipelines, as well as a short pipeline that will tie-in to the Beaumont industrial area. Start-up for the pipeline coincides with the terminal start-up. According to the Gulf Times DOHA, the Golden Pass Terminal will receive a third of the gas imports to the US, or 20 million tons, in two to three years of operation start up. May 10, 2011 – Golden Pass LNG Terminal LLC (Golden Pass LNG) announced Tuesday that it has been granted authority by the Federal Energy Regulatory Commission (FERC) to place into service the Phase 2 terminal facilities. Mar 14, 2011 – The Golden Pass LNG Terminal LLC and Golden Pass Pipeline LLC announced Monday that it has been granted in service authority by the Federal Energy Regulatory Commission (FERC) and has commenced commercial operations. Sep 28, 2010 – The Golden Pass LNG terminal announced Tuesday that the first cargo to be used for commissioning the facilities is anticipated to arrive during October 2010. Apr 10, 2009 – The U.S. Coast Guard said Friday that it has issued letters of recommendation for eight liquefied natural gas facilities under development on the Gulf Coast. Dec 19, 2008 – Recently uncovered damage at Exxon Mobil Corp.’s (XOM) $1 billion natural gas import terminal under construction in southeast Texas will delay the facility’s scheduled startup next year. 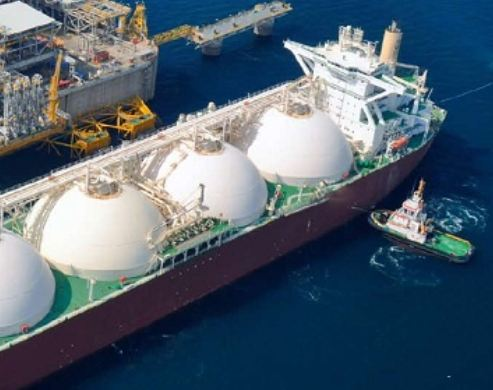 Dec 12, 2008 – The opening of the Golden Pass liquefied natural gas terminal in the United States will likely be delayed by hurricane damage, while Britain’s South Hook LNG terminal now looks set to open in early 2009, an executive from ExxonMobil said on Thursday. Jan 04, 2008 – Two pipelines tied to upcoming industrial projects soon will snake their way through the city with the Port Arthur (Texas) City Council’s stamp of approval. Dec 13, 2007 – A 42-inch pipeline running from the Golden Pass LNG facility through Port Arthur, Texas, en route to Calcasieu Parish, La., will be the subject of a Jan. 2 public hearing. Jul 19, 2007 – The City of Port Arthur, Texas, shed 180 acres of vacant land and another 26 acres of submerged land for the ExxonMobil LNG facility near Sabine Pass. Aug 01, 2006 – CB&I has been awarded a contract by Golden Pass LNG Terminal LLC for the engineering, procurement, fabrication and construction of a liquefied natural gas (LNG) import terminal located near Sabine Pass, Texas. Jun 30, 2005 – In front of a packed crowd that included some local, state and federal officials Thursday, the last day of Chairman Pat Wood’s term, FERC conditionally approved the Weaver’s Cove LNG import terminal in Fall River, MA, and the Golden Pass LNG terminal in Sabine Pass, TX. Apr 11, 2005 – The Department of Interior has said that FERC, in its draft environmental impact statement (DEIS) on ExxonMobil Corp.’s proposed 2 Bcf/d Golden Pass liquefied natural gas (LNG) terminal and associated gas pipeline along the Gulf Coast, failed to adequately assess the project’s impact on endangered species and wetlands.